If the next head coach at Michigan is not Les Miles, then a ton of calories (and jet fuel) have been spent for basically no reason. Let me first say that this coaching search has been run by one man, and one man only. Dave Brandon has kept a lid on anything that has been going on. People who say they're "in the know" are very few. And of those, most of them are lying. All of the rumors that surface on Twitter usually have the word "sources:" in front of it. Let me just tell you, unless something comes directly from Dave Brandon himself or the athletic department, then we're going to treat it as simply someone's pipe dream...like this morning when John Gruden's name was dropped saying he interviewed yesterday. No, we're not going there. Instead, we're going to track some private jets on the internet! The good folks at mgoblog have been tracking UM jets all over the southern United States. 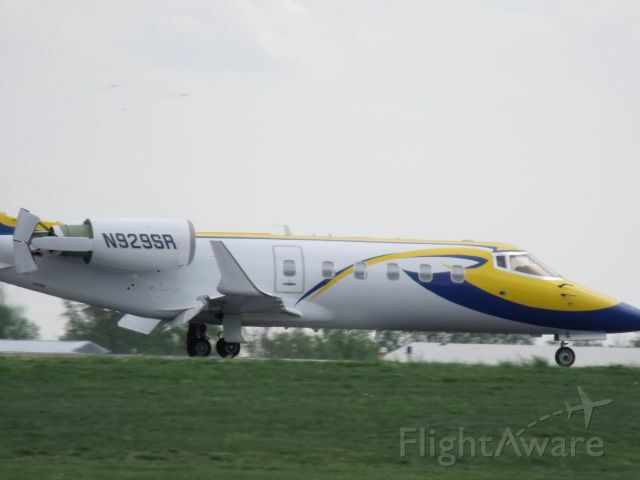 There is a report a Lear Jet that flew from Hilton Head, SC to Baton Rouge, LA today. This jet is the one you see below. This plane is not Dave Brandon's. His jet has been parked in Dallas after flying back from Scottsdale, AZ on Saturday. This jet in the picture is said to be that of very wealthy UM alum Richard H. Rogel, who donated $22 million to the U back in 2004. His jet flew into Baton Rouge on Friday. One thing that is strange is that Miles and his staff and team were in Dallas for the Cotton Bowl on that day. But I assume that the LSU brass was not, thus the reason for UM people being in Baton Rouge, I guess. But the flight this jet took from Hilton Head to Baton Rouge is the one that's the most interesting. Word is, Lloyd Carr has a vacation home there, and this plane was sent to pick him up. This jet has taken three trips into KSAV (Savannah Hilton Head International) in the last 2 days. Needless to say, if Les Miles does not emerge from this as Michigan's next head coach, then someone's going to have a tougher time paying their next Jet-A fuel bill. In all actuality, we're hearing more and more that Les Miles is going to be interviewed by Dave Brandon early this week. Miles has expressed an interest in the job, saying that it would be his dream job and likely his last. It has been reported that Miles would give the LSU AD a 24-hour notice before any interview would take place. As of this post, no one is reporting that the notice has been given, but real actual sources who really know something are few and far between. If Les Miles is in-fact interviewed, and then hired, then this shows that Lloyd Carr is still very much in the picture at UM and probably in a "power-behind-the-throne" role. Would I be surprised by this? Not in the least. That's enough speculation for tonight. More to come soon, I'm sure. Now why can't the Free Press to this kind of research?